The Sacred Page: SBL Audio! 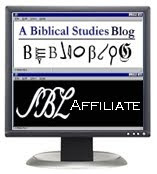 Hey bibliobloggers, I'm expecting some major hat-tippage on this one.... Blogger Andy Rowell, a doctoral candidate at Duke, has posted the audio of various papers read at the Society of Biblical Literature and American Academy of Religion here. (Thanks to Evy Nelson for the heads-up!) Here is the audio of Richard Bauckham's excellent paper, which I mentioned in my prior post on SBL. And here also is the audio of N. T. Wright's "God in Public - The Bible and Politics in Tomorrow’s World.mp3". Crossley and the others' critique of Bauckham's work seems to have generated quite a bit of discussion over the question of whether the philosophical question of the supernatural/miracles should be discussed in an academic conference.